The Environmental Science Institute provides STEM Ambassadors, undergraduate and graduate students from STEM majors at UT who volunteer at K-12 career fairs and STEM festivals. In the 2017-2018 school year, we interacted with over 1,000 K-12 students and 600 parents and educators during community outreach events. All STEM Ambassadors attend a workshop to assist them in developing grade-appropriate and interactive STEM activities. 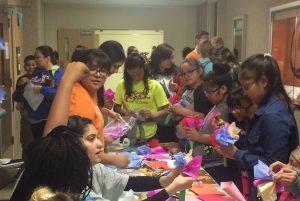 K-12 students design their own flower to attract specific pollinators during Explore UT. Attend the 2-hour workshop hosted by ESI. Additional workshops will be added in Spring 2019. Complete 6 hours of STEM community outreach during the school year. Must volunteer with ESI for one of the following events Hot Science – Cool Talks, Introduce a Girl to Engineering Day, Explore UT and Earth Day Austin. Participate in additional outreach opportunities shared by ESI (STEM festivals and school career days). Ambassadors have until the end of May to complete outreach activities. ESI will provide a certificate to all STEM Ambassadors who complete outreach. If you have additional questions about the program, contact Didey Montoya, Outreach Coordinator, at didey@austin.utexas.edu or 512-471-4211. ESI will do its best to accommodate requests. Due to the limited number of volunteers available, we currently do not have volunteers who can lead K-12 classroom visits, in-class presentations or field trips. If interested in having a volunteer visit your classroom or lead hands-on activities, please submit your request to Texas STEM Connections. As we continue to grow our program, we hope to expand the community engagement opportunities we offer.